Probably OK for routine home useage, but I just replaced it! 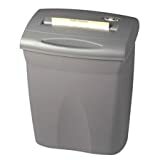 I have owned one of these shredders for about a year.I am an individual active realtor working from home and have a lot of things to shred.It has proved to be totally inadequate for my needs.I oil it very often with canola oil (per the instruction manual) at least every time I empty the receptacle bin.But it still jams very frequently.It doesn't handle the listed volume at all.You can only really put 2 or 3 sheets through at a time, and it still jams often.I have gotten the tweezers out for the last time on this shredder!Also, you can't run it for more that about 10 minutes continuously without it shutting itself down for at least 20 minutes to cool down.I just replaced it with the Fellowes C-120C.I just received it today and am really impressed with the difference.The PS80C-2 is probably fine if you don't do much volume.The design is very convenient, and it fits very conveniently under a desk.But be sure to oil it OFTEN!! I have had my PS80C-2 for a little over 2 years.My cutterhead supposedly had a 20 year warranty.I regularly (every shredding session) oil the cutters with canola oil (recommended in the owner's manual) and my useage is well below the claimed duty rating.Recently, the unit began to jam more frequently and the shreds started exiting as a single mass rather than as loose shreds.I called customer support and they had me inspect the bottom of the cutterhead for broken or missing plastic fingers.Several were missing.Even though these fingers are an integral part of the cutterhead and the cutter head won't function without them, Fellowes claims that they are not part of the cutterhead and that they are not covered by warranty.Still worse, they are not an available part so my only recourse (according to Fellowes) is to buy a new shredder!Fellowes self-serving definition as to what is part of the "cutterhead" and what is not is at best dishonest.Don't buy a Fellowes shredder for the warranty as they will define themselves out of honoring it.I did get a couple of years of use out of it though.So, if you can get a reconditioned unit really inexpensively, it might be worth a shot as a disposable product. While the waste can had a minor crack, which I fixed,due to delivery company. The head unit works well and it was recvd sooner than expected, by abot 2 weeks. I am very satisified with the unit and the quick shipping. This is the second Fellowes shredder I have purchased. Like the first one, this unit failed after about 1 1/2 years of use. Asothers have reported, my machine will only work in reverse. No complaints on its use, when it was working it was fantastic. Now that it is out of service, it is very inconvenient. Spending over $100 for this unit, the warranty should be longer than one year. Since the blades are not the issue, and repairing it is too costly, I now have to buy yet another one again. I'll need to compare costs and services before buying another unit. Another Fellowes product is in question at this time! This shredder worked pretty much as it said it would in the literature. 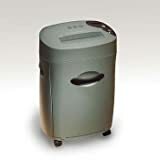 It is a step up from the low end "personal" shredders that can only take a few pages at a time and can't run very long without needing to rest. Aside from a basket that filled pretty quickly (you have to redistribute the shredded paper as it naturally forms a heap right below the blades), it did the job for me. But here I am 17 months later and it is semi-dead; it only runs in reverse and the operating lights are dim. I'm past the one-year warranty and only the blades are warranted for longer than that. It just dropped dead out of the blue and definitely wasn't overused. For a shredder that cost close to $100 I expect a LOT longer operating life. Don't buy it for the warranty! I am very happy this shredder's performance and price (really great price! )I have been using it just about six months on a regular basis, any thing with sensitive information is on its diet!Even old credit cards! I do follow the guidlines of unfolding bulky material and overuse and it performs like a shredding champ. I also avoid sending staples through it, I think it can handle them if I missed one, but don't want it to dull the blades sooner than nessary either.Glad that Amazon has this product available! I have owned two Fellowes paper shredders. 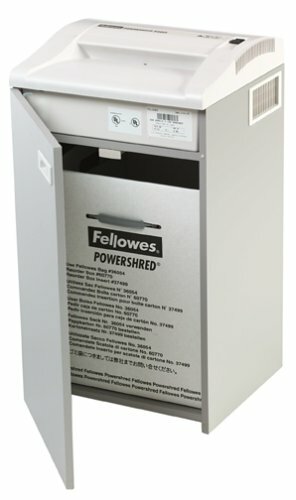 The second Fellowes shredder is the P400C-2. 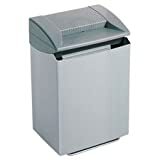 The only problem I have with Fellowes Paper shredders is that each Fellowes Paper shredder that I have owned has quit working maybe a year or a year and a half at the longest after I bought it. It cost too much to repair, so I had to buy another one that quit working about a year after I bought it. I purchased the Royal 150MX for light to medium home use, and it has worked very well, avoiding all of the problems I have listed.This product is on the large side but holds a lot of shredded paper as a result, I would say about 200 sheets before you need to empty it.To date I have shredded about 1000 sheets of paper without one jam, which may seem like a bold claim to someone who is used to using a paper shredder but is nonetheless true.The shredder still runs smoothly without annoying clicking or crunching sounds that cheaper shredders make when the teeth get out of alignment.The product automatically stops when the bin is full, a feature that prevents backup jams which will destroy a typical shredder. To summarize: I am extremely happy with this product.And as a word of advice to anyone getting a shredder for the first time, IMHO, don't be afraid to over buy: get a nice shredder such as this one.It may be double the price of some cheaper models (I say this after having had serious, terminal problems with a cheaper Fellowes shredder), but it is five times as reliable.You will use the product more than you think, especially in these days with all of the identity theft going on out there.Plus, it will bring a smile to your face and remind you of Orwell every time you use your brand new memory hole. Terrific Machine for Home Offices and Small Business! Protect important information and help stop identity theft with this shredder from Royal. Designed to handle a wide range of media, the MD100 shreds paper, compact disks, floppy disks, and credit cards into unusable 3/16-by-1½-inch confetti-style pieces so you can rest easy knowing that your personal information is properly destroyed. Time magazine named the MD100 one of the coolest inventions of 2003, due to its ease of use and ability to flatten raised numbers on credit cards before shredding them, among other things. 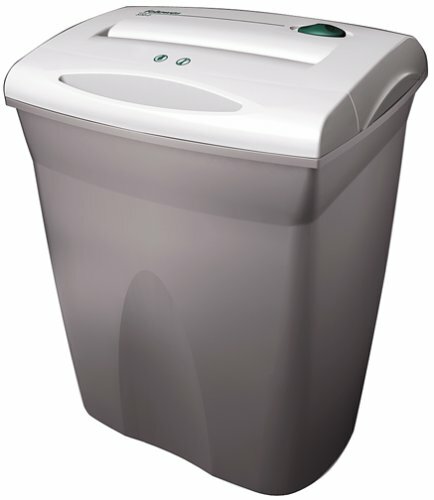 The MD100's 8.25-liter wastebasket is made of clear plastic so you can see the remains of your shreds and know when it's time to empty. 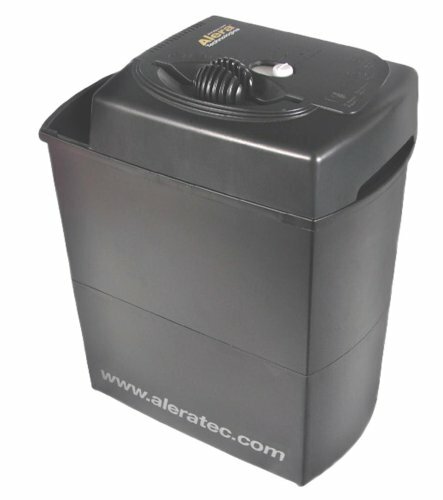 The auto start/auto stop setting lets you shred media simply by inserting it into the slot. The 5-inch slot size means that you do have to fold paper in half before shredding (up to 7 folded sheets can be shredded in one pass), but that's a small price to pay for a machine that shreds CDs and DVDs in less than 5 seconds. The MD100 has a 9.75-by-7.5-inch footprint, fitting neatly under any desk. It comes backed with a one-year limited warranty on both parts and labor. This is perfect for the desktop.It excels at destroying credit cards, DVDs, CDs and Floppy Disc.In an emergency you can use it to shred paper, including staples. Because DVDs, CDs and Floppy Disc are dense, they lay flat, and take up very little room in the debris basket.Since paper is light, it will bunch up, filling the debris basket fast.If you do a lot of paper, you want to consider a paper shredder with a larger basket. Because it is shredding polycarbonate and metal, the feeder slot snuggly fits DVDs, CDs, and Floppy Discs.This reduces the chance of high energy debris.Do Not look into the slot while shredding.Because of the snug slot, feeding paper into the MD100 is not quick.If you want to shred less than 8 pages, but cannot leave your desk, you can use the MD100.If you want to shred more than 8 pages, or can leave you desk, it is better to use a paper shredder with a larger feed slot and a larger basket. 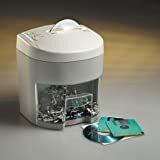 This is also a personal shredder, if you need to shred from more than two minutes at a time (approximately 24 DVDs or CDs or Floppy Discs), you should get a commercial grade machine. Literally destroys cds, dvds and floppy disks.I was surprised when it chomped its way through the floppies, metal and all and left nothing but little pieces. As far as paper is concerned, I would use an other kind of shredder such as a confetti type as this one you have to fold the paper so it doesn't always shred in small enough pieces. If you have media to get rid of, there is no better little shredder than this.I keep it next to my computer and it doesn't take up much room so it is very handy to use. This is a great shredder if you want to destroy CDs, DVDs, and credit cards, but I'd pass if you are looking for a personal shredder to effectively destroy paper. The shredder appears to almost completely destroy CD's, leaving very, very small pieces in the catch basin. The paper shredding functionality is not nearly as good as cross-cut shredder, leaving pieces that could easily be reassembled by somebody who enjoys puzzles.In order to shred a standard piece of paper, you must fold the pages in half, and you can only shred seven pages at a time. The credit card shredding is about the same as paper, but since cutting credit cards up with scissors is even less effective, this is a good choice for that purpose. This shredder is a little workhorse. It does exactly as it says, I've noticed the safety button shuts off if you leave it switched on all the time, but why would you need to, when I discovered this I had just forgotten to switch off; I always do now and it resets the safety feature. 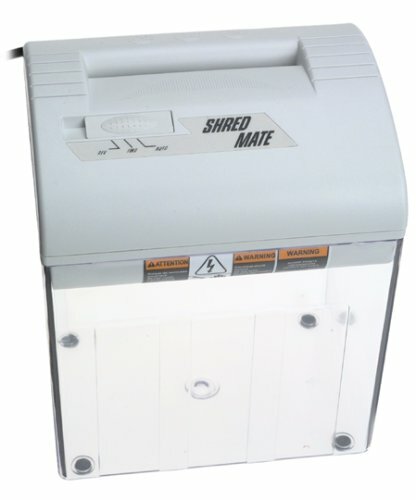 In an age when shredders are must have items for security reasons, this is a good basic model and it works hard. I don't understand comments like "don't get this is you have children", it's like saying "don't buy bleach or carving knifes if you have children". First of all how about wall mounting out of harms reach? Second, how about telling the kids it's dangerous, not a toy and will eat their fingers and last of all, why leave it set up waiting to mame and in harms reach??? This is a great little shredder.It works exactly as the manufacturer says, 2 minutes on and 4 minutes off to cool.I've found it works longer than 2 minutes.We have shredded years worth of documents without a single problem.Great for household use.Not a safety issue for us at all and we have 4 children. I recommend against this shredder for families with children. After filling the hopper one time, about a month and a half, the automatic shutoff quit working. The Shredder must be shut off after each shredding. I suppose the shredder is okay if you don't have children and don't mind turning it off between uses. Now for the No Service. They are prompt to return your first call. This is good. Bad is the fact that I was told there were no service centers in the whole state, and would have to pack it up and pay shipping both ways. I can buy a fellowes shredder for the price of the shipping and have a new shredder that works safely and real service if I need it. Go for a walk tonight and hold your child's hand firmly, they are little no longer all too soon. Did the cheaper shredder break? Try this one. In my neighborhood, your garbage is examined by dumpster divers like CSI on a fresh crime scene. I don't think they all necessarily want your credit card statement, BUT it is unnerving to watch all those credit card offers with your name on it go in the same sack as a bank statement. All you need to do is watch the same garbage can for a while and you get enough info - credit card numbers, old bank statement, mother's maiden name - to open a new account. So I bought the cheapest shredder I could find -heck, I'm not Enron/the government/a tobacco company! I don't need the heavy duty stuff! And it stunk. No power, no capacity and messy. I bought this one and I'm thrilled. Relatively cheap, fast, built-in basket for waste and can go right through old bank statements. I think this is the right model for the adult who doesn't want to pay for a pro model, but just doesn't want someone charging crack on a fake Visa card. I've had this shredder for about 1 1/2 years now.It shreds ok, don't put more than 3 sheets in at 1 time.The cross shredding works, but seems to make the strips catch back into the roller at times.The unit will jam sometimes with 3 pages or less.For the price, I would look at other shredders in it's class before purchasing again. Croos-cut shreds great. Believe it or not I use the shredded paper to line my bird cages - it works great! I got it from the seller, price_busters and it is the exactly same one as the picture. It works great. It can shred papers and even credit cards into unreadable small pieces. It works for up to 5 pages of papers at one time and has gone for as long as 15 minutes without cooling down. It is fairly quiet and even has an auto button to allow it to work only when it actually detects papers into it. You can also easily clear it when it's jammed using a reverse button. Furthermore, the trash basket is very easy to empty it and holds quite a bit. I even put a trash bag into it and throw away a whole bag. I am quite satisfied with it. 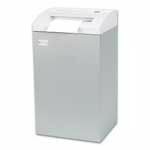 Help secure your identity and your credit record with Royal's 10-sheet VF1000MX vertical-feed crosscut paper shredder. 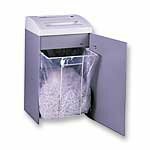 The shredder accepts up to 10 sheets of paper at one pass and makes an easy lunch of your staples, small paper clips, credit cards--even your obsolete backup discs via a dedicated CD/DVD slot. Jam-free rollers reduce paper jams, and the unit's steel gears are built to last. This unit is a piece of junk. 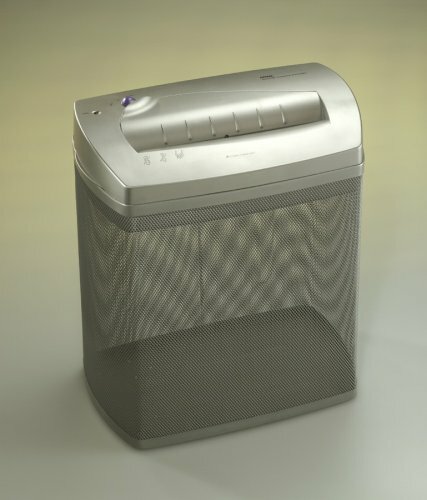 Fellowes recommends that you run the shredder for no more than 2 minutes at a time and allow a 4 minute cool down time. I cannot recommend this item. It went back to the store for a refund. The Fellowes Powershred 220CC crosscut shredder is packed with convenient features for your office shredding needs. A shredder provides the security and privacy you need by destroying your personal and confidential documents. 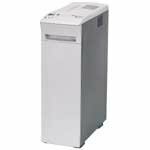 The Powershred 220CC can dispose of 8 to 10 sheets at a time. It has a large entry of 9 inches to accommodate wider documents and shreds at 22 feet per minute. Plus, the paper clips and staples that you leave in your documents will not damage its hardened-steel blades. 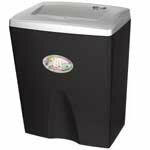 The Powershred 220CC includes an integrated stand and a removable 18.24-gallon wastebasket. It features electronic automatic start/stop that is activated by a sensor on the blade mechanism. The full-bag indicator light alerts you when the waste bin needs to be emptied and helps avoid paper jams. Electronic overload protection ensures that the shredder does not overheat, by automatically turning off the blade operation and allowing it to cool when necessary. This shredder works well enough for the occasional one sheet at a time purpose.However, it doesn't come close to living up to the purported 7-9 sheets/22 ft per minute advertisement.Certainly not worth the price! This shredder is excellent for heavy home-office use. 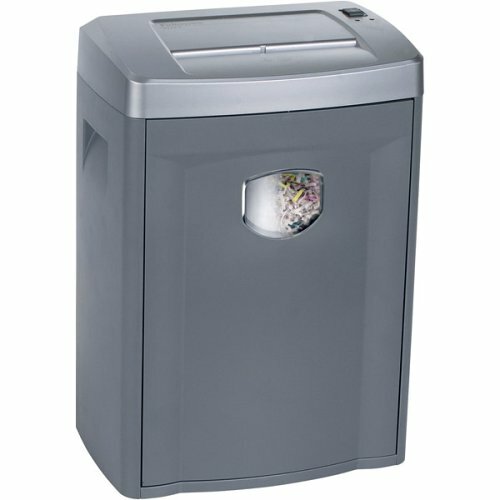 Positives:the shredder has a large disposal bin; can shred 4-6 pages at one time adequately, including stables; has good safety features, such as auto shut off when shredder is overloaded or when the disposal bin door is ajar; corss-cuts for security (not the strips common in low-end shredder) and heavy duty construction. Negative:when this paper shredder jams (which is rarely and only happens if you are drastically exceeding the amount of pages trying to be shred beyond a reasonable quantity) it is very hard to undue the jam.I have had to keep flipping the forward and reverse switch back and forth continuously in order to work through the jam.In addition, the receptacle in the disposal bin, in which the shredded paper is collected, is made out of cardboard. I would recommend frequent use of the blade oil, included with the purchase of the shredder, in order to insure a smooth and quieter operation. 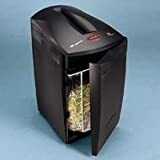 Overall, the best shredder on the market.I have owned three other shredders before researching and buying Fellowes Powershred 220 Cross Cut Shredder. I bought one of these [at a store]. It looks a little different from the one at the picture but the name is the same. Mine has the opening in the front and the switch in the back. It's pretty small and sits anonymously on your desk. The opening is 4 1/2 inch wide, just enough to cut a letter that's folded in half. It does a good job. No paper jam or unshredded paper. The wastebasket is small and doesn't hold much. The paper pieces get somewhat bent so they don't fall flat hence they take up more space in the basket. It's definitely not for heavy use but for use in your office where you just need to shred a few pieces of paper once in a while it works perfect. This unit is a good shredder - the confetti it generates is well-shredded.But I find this unit is a real pain in the patootie to empty.There's no handle to grab - it's a smooth, nearly featureless shred-unit that contains a heavy shreding head and motor.There's just nothing to grab to get this thing off the container portion.And when you do open it, shredded paper tends to scatter itself.Because of a safety slot, I can't figure out how to put a liner bag into it.It shreds well, but it is a pain to empty. I decided to ignore all the other bad reviews about this product and purchased this machine, figuring I might get lucky. It failed within one minute of use. I tested it first with some bulk mailings and then a CD through its CD shredding slot. It never ran again after the CD. Total run time was under a minute. I'm glad it failed because now I'm forced to return it. I might have lived with the terrible ergonomics of this unit if it had not failed. The ergonomics are just terrible:The paper slot is exactly 8 1/2" wide, so you must be very carefull about aligning the papers you wish to shred each and every time you insert them! Even worst is the fact that the paper slot reguires that you insert paper vertically. Now my waste paper basket is under my desk and there is not enough room to insert my trash vertically into the slot provided. Even if there was enough head room under a desk, you'd have to peer underneath your desk, each and every time that you wished to shred something. It would be hard to design a worse shredder, ergonically. 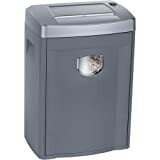 I just purchased a shredder from Staples for $79.94 with free shipping (Identityguard 24 sheet item no.576954). It is a day old but already it seems far superior to the Royal. It also passed shredding a CD. Its paper slot is very wide and is at a 45 degree angle allowing me to insert paper easily into the shredder, which is under my desk. The one difference I have noted between this shredder and the Royal is that the Royal, during its brief lifetime, shredded things into smaller pieces. The Staples unit shreds paper into 1/4" strips that are also the length of the piece of paper. The Royal also shredded paper into 1/4" strips but also cut this strip into shorter pieces. So the Royal was more secure but for most home users who really cares. If you are looking a shredder for a Doctor's office this is probably not the shredder of choice but a doctor's office should not be looking at $100 shredders. For most users that do not need a CIA quality shredder I am not sure the shredding method is important. When we got this thing it was great. it handled everything we threw at it beautifully and effortlessly. then after about 6 months, the containter was full, we turned it off, emptied the container, and it never powered back on again. i called royal and their help desk is a recording telling me to mail my reciept to a PO box in New Jersey to get the return authorization. forget that, i need a shredder, not to wait 4 months for them to get back to me. so i called the local service center and talked to one of their repair techs. he told me its one of two things, the fuse thats soldered to the main board or the main board fried. reguardless, the labor warrenty is only 90 days so i would have to pay $48 an hour labor to fix it. the tech said he considers these disposable, use it till it breaks and buy a new one. When shredding paper, credit cards, & CD/DVDs worked great--but, its effectiveness didn't last.While shredding a pile of papers, the shredder jammed.I don't think I exceeded the maximum sheets allowed at one time.But, even after attempting to clear the shredder's blades (difficult, if not impossible), the shredder turns on (sometimes), but it won't shred.I can not locate my receipt, so I'm stuck with a $100 useless box of cheap plastic. Good while it lasted - both times. by General Binding/Quartet Manufacturing. Co. Manufacturer: General Binding/Quartet Manufacturing. Co. Recommended Shred BagUNV35947 and FEL36054, both sold separately. Frequent oiling of cutter blades is recommended for all shredders in order to maintain sheet capacity. 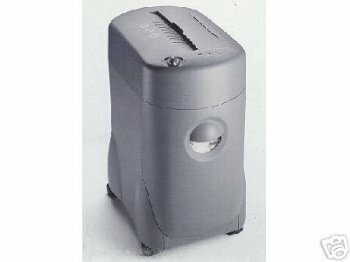 Shredder Oil (GBC35250), sold separately.